Terrorists want to use the unmanned machines - available for as little as £100 on the high street - to drop explosives on large crowds at popular sporting and cultural gatherings. A counter-terrorism source said: "Islamist plotters have been trying to launch a drone-borne bomb attack for some time, as these machines are getting more hi-tech every year. "They want the spectacular devastation of such a raid, which would cause murder and maiming in a crowd, while filming it for a sick video. "Isis is obsessed with re-creating the horror of 9/11 and believes this may be possible by launching a multi-drone attack on large numbers of people in a synchronised attack." Colonel Richard Kemp, who has advised the Government on terrorism, told the Mirror: "There is a genuine threat from Islamists wishing to deliver high explosives by drone to crowded areas. The effects could be devastating." That’s the unofficial motto for this year’s edition of the military exercise Black Dart, a two-week test of tactics and technologies to combat hostile drones that begins Monday on the Point Mugu range at Naval Base Ventura County in California. The military categorizes Unmanned Aircraft Systems (UAS) by size and capability, from Group 5 drones that weigh more than 1,320 pounds and can fly above 18,000 feet like the Reaper, down to Group 1, mini- and micro-drones less than 20 pounds that fly lower than 1,200 feet. Previous Black Darts have covered threats to troops overseas and targets at home posed by drones of all sizes. But small drones are this year’s focus, said the director of this 14th edition of Black Dart, Air Force Maj. Scott Gregg, because of worrisome incidents since the last exercise. Gregg also could have mentioned how, to protest government surveillance, the Pirate Party of Germany flew a small drone right up to the podium as Chancellor Angela Merkel spoke in Dresden two years ago. Or how in Japan last April, a nuclear-energy foe landed a drone carrying radioactive sand on the roof of the prime minister’s residence. 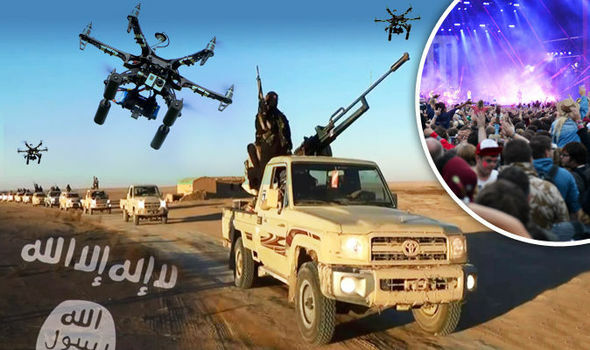 And there was a report last week that British officials are worried ISIS may try to bomb festival crowds using small drones. The United States enjoyed a near-monopoly on armed drones for much of the past 15 years, but with more than 80 countries now buying or building drones of their own, and with terrorist groups such as Hezbollah, Hamas and ISIS known to have used unarmed drones in the Middle East, that advantage has evaporated. Few countries and no terrorist groups are likely to emulate the complex and costly US system of undersea fiber-optic cables and satellite earth terminals in Europe that allows crews in the United States to fly drones carrying missiles and bombs over Africa, the Middle East and South Asia. But anyone can buy a Group 1 drone for a couple of hundred dollars and put it to nefarious use. Arm it with plastic explosives, radioactive material, biological or chemical agents, and it can be crashed, kamikaze-style, into a target. “I’d say for the Department of Homeland Security, it’s one of the biggest concerns,” Gregg said. The threat isn’t imaginary. Former Northeastern University student Rezwan Ferdaus is now serving 17 years in prison for plotting to pack C-4 plastic explosives into 1/10 scale radio controlled models of F-4 and F-86 fighter jets and fly them into the Capitol and Pentagon. Ferdaus also supplied cellphone detonators for IEDs to people he thought were agents of al Qaeda but turned out to be working for the FBI. The military has largely kept its work on the problem quiet to prevent hostile actors from learning what defenses and countermeasures the US possesses. The Defense Intelligence Agency conducted the first Black Dart exercise in 2002 under a veil of secrecy, and the annual event stayed veiled through 2013. Now run by the Joint Integrated Air and Missile Defense Organization (abbreviated JIAMDO and pronounced “jye-AM-doe), Black Dart’s existence was revealed in 2014, and select media were invited for a day last year “just to let everybody know that the Department of Defense is aware of this problem, we’re concerned about it and that we’re working on it,” Gregg said. Black Dart 2015 will feature tests of 55 systems brought to Point Mugu at their own expense by an assortment of military units, government agencies, private contractors and academic institutions. JIAMDO’s $4.2 million budget for the event covers the cost of running the Point Mugu range and providing a small fleet of “surrogate threat” drones. For five hours each day, Gregg’s Black Dart team will fly up to six drones at a time over the range while participants test radars, lasers, missiles, guns and other technologies they think the military might use to detect and kill or neutralize drones of all sizes. This year the surrogate threats will include three Group 1 drones — a Hawkeye 400 hexacopter, a Flanker and a Scout II — and one Twin Hawk drone from the Group 2 category (21 to 55 lbs., slower than 250 knots, lower than 3,500 feet). Six Group 3 drones, all of them 13.5-foot wingspan Outlaw G2s made by Griffon Aerospace, also will be targets. One nice feature for contractors: Failure is an option. Black Dart isn’t an official procurement milestone, so companies can test their technologies there knowing that if they don’t work as hoped, there’s no obligation to file a report that might lead the Pentagon or Congress to cut their funding or cancel their program. They can just use the test results the way test results were meant to be used — to find out what works and fix what doesn’t. “We should have about 1,000 people at Black Dart this year between participants, observers and support,” Gregg said, noting that the departments of Energy and Homeland Security both will send observers. But while Black Dart is no longer secret, the public isn’t invited. “It’s absolutely not an air show,” Gregg said. Even the media won’t be allowed to see or hear about everything that goes on at Black Dart 2015. Much of what previous exercises came up with in the way of countermeasures also remains classified, said Marine Lt. Col. Kristen Lasica, spokeswoman for the chairman of the Joint Chiefs of Staff. “We can’t let the enemy know what we’re going to do,” she explained. A Navy MH-60R Seahawk helicopter shot down an Outlaw surrogate threat drone with a .50-caliber gun, proving old-fashioned solutions can work fine against new-fangled threats. The USS Ponce, an Afloat Forward Staging Base deployed to the Middle East, today is armed with a 30-kilowatt Laser Weapon System (LaWS) that shot down an Outlaw in a test at Black Dart 2011. The futuristic weapon is also good against slow-moving helicopters and fast-moving patrol boats. At Black Dart 2012, an AH-64 Apache attack helicopter killed an Outlaw with an AGM-114 Hellfire anti-tank missile. MQ-1 Predators and MQ-9 Reapers the Air Force flies for itself, and the CIA uses the same basic missile for drone strikes, but the Hellfire at Black Dart was modified with a proximity fuse to detonate in the air next to the target, demonstrating another way to defend against drones. Test results at another Black Dart helped Syracuse research and development lab SRC Inc. write software tying together three devices to create a drone counter-measure “system of systems.” SRC connected their AN/TPQ-50 counter-fire radar, designed to detect and track the source of incoming artillery, mortar and rocket fire, to their AN/ULQ-35 CREW Duke electronic warfare system, which jams and locates remote-control devices. Then SRC tied those sensors to a Switchblade, a small, tube-launched drone with sensors that can carry an explosive charge the size of a hand grenade, made by AeroVironment Inc. The result is a weapon that can either jam, take control of, or shoot down a hostile drone. The latter stands as “one of our greatest success stories from Black Dart,” Gregg said. It also illustrates one of the major findings of Black Dart over the years: there is no “black dart” — no single weapon — to counter drones. The best defense clearly lies in cobbling together “systems of systems” as SRC did, to detect, identify, track and neutralize hostile drones. Doing all that is a bear of a problem, especially when the challenge is to spot and stop a small drone. “We’ve gotten better at detecting some of the Group 3 size, the larger UAS that are flying today,” Gregg said, but the limitations of radar and other detection methods make it harder to even see what the Defense Department calls LSS — Low, Slow, Small. “They’re the same size as birds and other obstacles that are out there,” Gregg said. Florida mailman Doug Hughes starkly demonstrated the problem on April 15, when he flew a gyrocopter down the National Mall undetected — through perhaps the most restricted public airspace in the nation — and landed on the west lawn of the Capitol with letters to Congress demanding campaign-finance reform. Especially if an enemy were to launch a swarm of drones — a tactic the US Navy has been developing. In addition to all that, even if defenders spot a small drone and can track it with enough time to try to knock it out of the sky — a shotgun might suffice in many cases — doing so in a city could risk harming innocent bystanders or damaging property. And what if that LSS UAS flying near the Capitol isn’t controlled by a terrorist but by a kid who just doesn’t know any better than to play with a drone on the Mall? Richard Whittle is the author of “Predator: The Secret Origins of the Drone Revolution” (Henry Holt and Co.) out now. CBS News has learned that the Department of Homeland Security has sent an intelligence assessment to police agencies across the country about drones being used as weapons in an attack. The bulletin went out Friday and warned that unmanned aircraft systems or drones could be used in the U.S. to advance terrorist and criminal activities. Law enforcement sources say, "emerging adversary use of Unmanned Aircraft Systems present detection and disruption challenges." According to federal officials, "The rising trend in UAS incidents within the National Airspace System will continue, as UAS gain wider appeal with recreational users and commercial applications." The bulletin goes on to say, "while many of these encounters are not malicious in nature, they underscore potential security vulnerabilities... that could be used by adversaries to leverage UAS as part of an attack." Currently, intelligence bulletins are released almost weekly as law enforcement responds to threats from ISIS sympathizers. But the release of a bulletin dedicated to the threat from UAS is unusual. The bulletin does not mention any specific upcoming events authorities are concerned about but points to the overall security challenges drones present.